With real-estate being a premium even in difficult economies, many backyards today simply don't have a whole lot of space. This being said, just because you have a small backyard doesn't mean you shouldn't consider installing an inground swimming pool. In fact, a small yard can really flourish with the addition of a small pool design and all it has to offer. This article will discuss some of the common questions associated with installing an inground swimming pool in a small backyard. What's the best small pool design for a small yard? 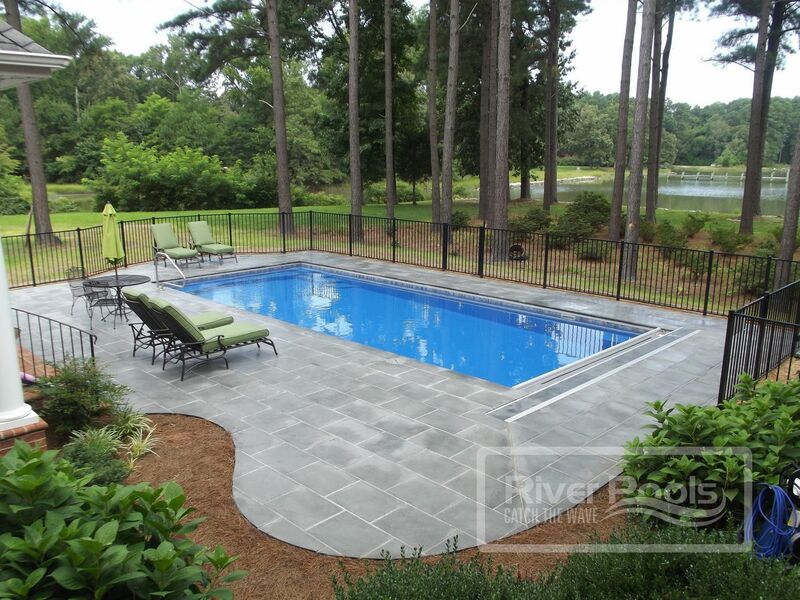 Vinyl liner and concrete pool shapes can be customized; fiberglass pools are limited to existing molds. Fiberglass pools need the least maintenance. Freeform designs allow more patio space, and linear shapes maximize water space. All accessories and options work with small pools just like with bigger sizes. When considering which type of pool and pool design is best for your small backyard, there really isn't a strong advantage one way or the other, assuming you find the swimming pool size and shape you're looking for. Example: Let's assume that you only have a 7'x21' area for the actual pool. Because fiberglass is limited in certain sizes*, and depending on who the fiberglass pool manufacturer is, it is possible that fiberglass wouldn't be an available option in this case. Don't know which type of pool is the best choice for your small backyard? Our free guide will help you understand the advantages and disadvantages of fiberglass, concrete, and vinyl liner pools. On the other hand, vinyl liner and concrete inground pools can be whatever shape you would like, with very few limitations. Occasionally, homeowners wonder if fiberglass pools will fit around their house because of size. In cases where the pool is too big to enter the backyard on the left or right side of the house, it is not uncommon to simply crane the pool over the house. This is rather easy to do in most cases. Which inground pool design will offer the least amount of maintenance/work? When it comes to small pools, it can be assumed that they take less time to maintain than large ones. However, many variables come into play here: what type of pool you have, whether you have an automatic pool cleaner, what kind of landscaping surrounds the pool, etc. It's generally accepted in the swimming pool industry that among the 3 types of pools, concrete will be the most difficult to maintain on a seasonal and long-term basis. Vinyl liners are easier than concrete on a seasonal basis (in terms of chemicals and cleaning), but also must have their liner replaced on average every 8-11 years. Of the 3, fiberglass pools will certainly be the least amount of maintenance on a seasonal and long-term level. What swimming pool shape is best for a small backyard? The best answer to this question is "it depends." Every backyard is different, and you have to work with what's available to you. But one key thing to remember is that curvy pools—like a kidney shape—lose some water space with their freeform characteristics, but they also allow for more potential decking space. Remember, if you're looking to at least have a lounge chair on your pool's patio, you will need at least 7 ft. of decking in that area. And if you'd like to fit a table with chairs, you'll need even more. It is for this reason that freeform pools are very common in small backyards. What are the small pool trends we are seeing today? Take a look at vacation places like Nags Head, NC; Myrtle Beach, SC; and others. Fiberglass pools have become very prominent in these areas, where the backyards are typically very, very small. In Florida, fiberglass has grown quite a bit in recent years, but concrete pools still make up the very large majority of small pool installations in that state. As for Texas...well, they don't do anything small in Texas! Can small pools still have the same features that big pools have? The short answer here is "yes." You can add any swimming pool accessories or features you'd like to a small pool design. Features such as pool heaters, pool lights, and automatic covers are not limited by the size of a pool. And if you're thinking about adding a tanning ledge or baja shelf, you can integrate it right into the design! Small backyards work just as well for installing inground swimming pools as large backyards do. The best type of pool for a small backyard really depends on what the end goal of installing the pool is. Vinyl liner and concrete pools can be whatever shape you'd like, while fiberglass pools are a bit more limited in that area. Fiberglass pools offer the least amount of maintenance. Freeform pools are very common in small backyards, due to the fact that they allow space for decking, patio furniture, and landscaping options. Small pools can still have any of the features that large pools can have. What other questions do you have about installing an inground pool into a small backyard?Comment below to let us know. If you're currently considering which type of inground pool would be best, download our free comparison guide, "Comparing Fiberglass, Concrete, and Vinyl Liner Pools in the Modern Age." Editor's note: This blog article was originally published in March 2012 and has been updated and revamped for accuracy and appearance.